Flying with a child can be a great challenge for parents. 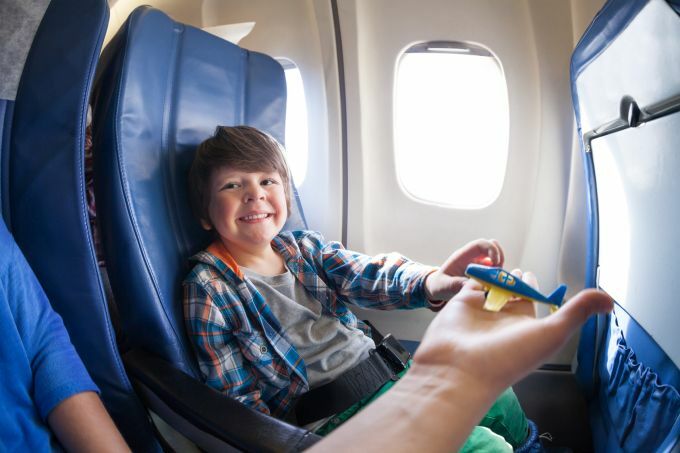 Whatever your child’s age, you should bring several toys and have ideas ready for games to help you and your child pass the time during the flight. And what do children love best? Having fun together with their parents, of course! How can I entertain my child on the plane? The toys and games you choose depend on your child’s age and preferences. But don’t forget to keep in mind the duration and time of your flight. The best option is to fly overnight because you and your child can sleep for most of the flight. If that’s not an option, then prepare well for the journey. Flying can be a wonderful experience for your child. And while your airline will offer a children’s menu, make sure you don’t forget to take your kid’s favorite snacks. Traveling with an infant? Your company and some diapers will be enough. You can also take a rattle, or wear a necklace made of beads – your little one will be sure to treat it like a toy. If your baby is already a few months old, you can take a ‘book’ made of cloth and other material. These kinds of toys feature lots of pockets, strings, and hidden surprises. There are new challenged to be discovered on every page. Children get bored quickly and you’ll almost certainly run out of toys. So, what to do now? Have some ideas for games to play that don't need toys. word games, like saying a word beginning with the last letter of the word before it, words starting with a specific letter, words related to a topic, etc. use your imagination – what would you do in the clouds, on a desert island, if you were pirates, etc.